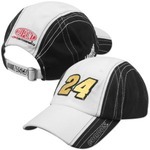 Jeff Gordon #24 Du Pont Racing on a new black and white ball cap for ladies. It has a rear adjustable strap and buckle with NASCAR on it. #24 on the front and Dupont on the back. Just a few left of this cap.